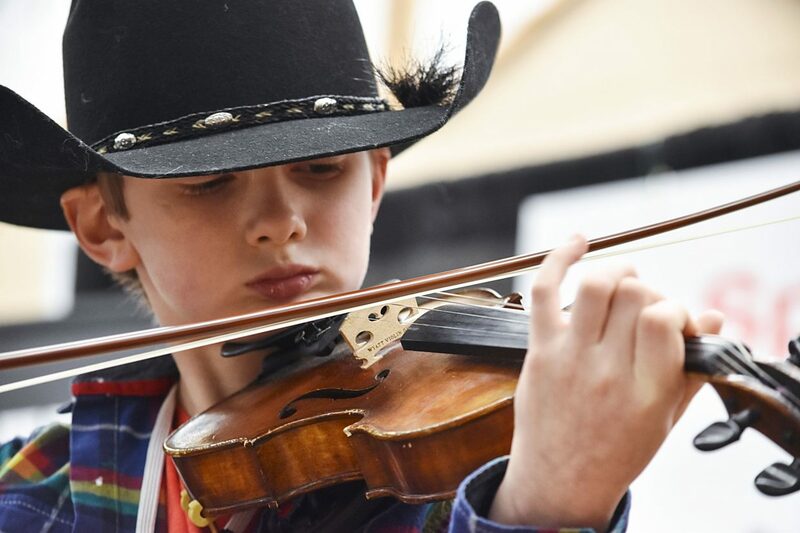 Tarquin Bennion, 10, of Sidney, Mont., plays his fiddle during the Junior-Junior division, which is for ages 9-12, of the Colorado Fiddle Championships Jan. 7 at the National Western Stock Show in Denver. Bennion placed second in the division. Jesse Quintana, 9, remembers his grandmother’s house being full of old musical instruments. As a toddler, he was fascinated by them, but kept picking up Grandma’s fiddle. He was only 3 years old when his grandma bought him one of his own — a miniature version only 1/32 the size of a regular violin. He started playing right away, but as he recalls it, he only started playing the good stuff — actual songs — once he was 3 1/2. On Jan. 7, Quintana from Lakewood, Colo., won the Junior-Junior division (ages 9-12) of the Colorado Fiddle Championships, held by the Colorado Old Time Fiddlers Association Championships at the National Western Stock Show. His fiddle was a little bit larger — still not full-sized — and he was a bit better than he was when he was 3 1/2. But as he sat in the bleachers of the Beef Palace Auction Arena on the second day of competition, he cradled his instrument on his lap. Though he was finished playing and only had the awards ceremony left to wait for, he wanted to keep his favorite instrument close. The style of old-time fiddling is, well, one that’s rooted in old-time tradition. New fiddlers learn tunes by ear from other players, and the “hoe-down” style music is often learned from listening to songs over and over. At the competition, each fiddler played a hoe-down style tune, a waltz and a song of their choice, along with accompaniment on guitar. There’s no sheet music on stage — it’s all done from memory. Crowds are encouraged to hoot, holler and cheer after songs, but refrain from clapping along, “as tough as it may be,” the announcer said. The competition is open to fiddlers from age 5 through 80 and older. The youngest compete in the Small Fry division, like 7-year-old Adelie Tillman. As Tillman started playing her waltz-style tune, “Amazing Grace” her mother, Briana Tillman, let out a sigh of relief and whispered, “we had to learn (this) last night.” The little girl, wearing all Western attire from her white boots to her pink cowboy hat, played the song without a hitch and placed fifth in her division. Fiddling is a family affair for the Tillmans. Everyone in the Colorado Springs, Colo., family plays some instrument, including Adelie’s two older brothers who play the violin, the string bass and the cello. Together, the family plays in a classical string ensemble and bluegrass band. Fiddling is also a family affair for the Bennion family, who traveled to the stock show from Sidney, Mont. Tarquin Bennion, 10, placed second in the Junior-Junior division. His older sister, Annika, placed fifth in the Junior division. Tarquin and Annika’s mom, Daniela, said the reason she wanted to get the kids involved in music is because it allows them to learn to be self-motivated and confident, especially once they start performing. Not every day is easy, and sometimes, just like any child, the Bennions would rather not practice, Daniela said. But they’re talented, dedicated and treat music as seriously as any other extracurricular. And that sentiment is true across all age and talent levels. For Lakewood, Colo., fiddler Trish Osthoff, who competed in the Senior division, the camaraderie of the Colorado Old Time Fiddle Association and all its members is one of the biggest perks. Osthoff didn’t begin playing the fiddle until she was already an adult, but found after attending a competition that she couldn’t stay away. She met her teacher at that contest, as well as some of the people who she would soon compete against. But even at the championships, and at a venue like National Western, it doesn’t ever really feel like it’s competitive, she said. The people who you take up rosin and bow against will also play accompaniment for you. The older, more experienced players help the little ones tune their fiddles. Everyone is always available to listen, give feedback and most importantly, help. Osthoff said being at a venue like the stock show just makes that bond even more special. She grew up around horses and attended the show every year. National Western has sponsored the Colorado Fiddle Championships for 16 years, and she’s come to every single fiddle show held at the stock show. — Work is a freelance reporter from Lakewood, Colo. She can be reached at nwork17@gmail.com.